Please check out what the rest of the sketch team did , and come and play along with us! 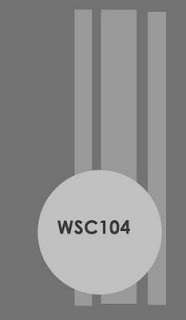 Remember to use the keyword WSC104 if you upload to SCS. Paper: Nook & Pantry (BasicGrey), Red Bazzill,Pink Prism, Neenah White. Other: Circle Nesties, Circle Scallop Nesties, Ribbon, BasicGrey Brads, Janome Sew Mini, Zip Dry, Scor-Pal. Have a super Halloween weekend! Be safe! Thanks for stopping by! 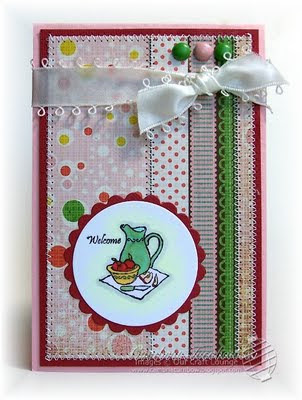 Oh, pretty paper, Cami, and that stamp set is perfect for it! So glad you got to stamp today because this is darn cute! Hope you have a wonderful Halloween weekend! Love this paper, Cami! Perfect for the image and the sketch. So cute! Awesome card, Cami! I LOVE the paper you used and your stitching! Well, DANG, girl! So glad you got to stamp! This is adorable! Hope you're doing well, my friend! Super cute! Love your paper ribbons up the side. 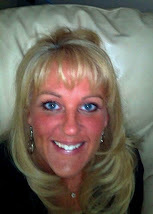 :) Hope you had a wonderful weekend! Hugs!